This April was full of new insights and work. 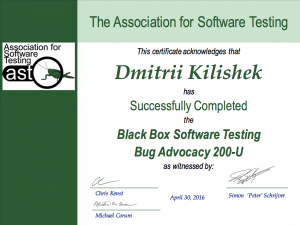 BBST Bug Advocacy course wasn’t that tough as BBST Foundations, but it was still very insightful! The most enjoyable part of the course was my work with fellow students, it was challenging due to our different time zones. The second inspiring thing was our work on unconfirmed issues in OpenOffice bug tracker. That was a good challenge, it was hard to find an issue to work with, because few of them had a chance to be reproducible. Material for the course available here and anyone who’s interested can watch lectures and slides for free. Update from 5/14/2016: I’ve completed the course! Hooray! Have just got a confirmation 🙂 Now I’m waiting for my certificate to arrive. Finally my certificate has arrived! 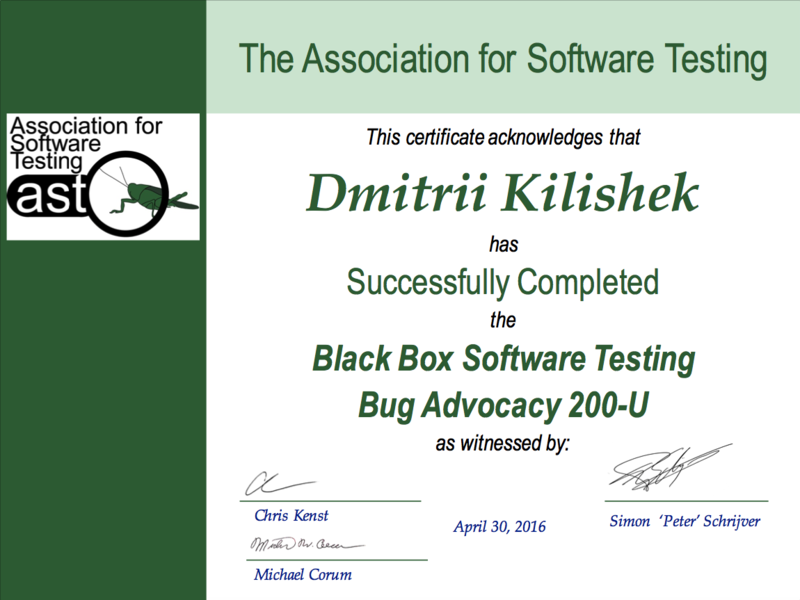 Thanks to AST and my instructors! Next Next post: This is how Groupon helps their merchants to rip off customers! Beware!